Photo by Jim Gipe Pivot Media. © The Eric Carle Museum of Picture Book Art. In celebration of the exhibition A Marriage of Artistry: Leo and Diane Dillon, we explored collaboration through collage in the Art Studio. We were inspired by the collaboration not only between Leo and Diane Dillon to create their artwork, but also the intricate frames that their son, Lee, made for some of the works featured in the exhibition. 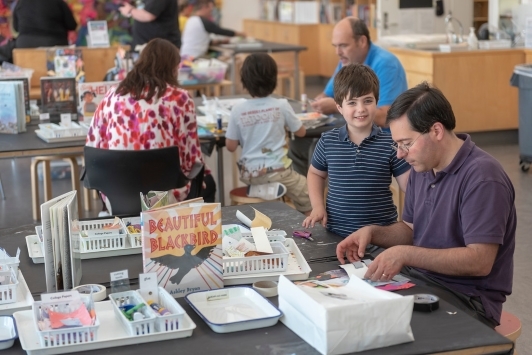 Over the course of a month, guests experimented with scissors, hole punchers, glue, and collage papers to create pictures on both picture backgrounds and frames. To prep for the project, we cut frames out of black railway board and white rectangles out of construction paper to serve as the two starting points for the collage. We also had our collection of collage papers from previous projects that added a variety of paper colors, textures, and weights to the available materials. To encourage collaboration, we had the installation on the wall as well as in the windows so guests could fill other guests’ frames or frame other peoples’ artwork. The installations in the windows invited a way to play with the light using the translucent collage papers. The clothespin lines worked well as guests could take an artwork down, add to it, and then pin it up again. Some guests used the windows to frame the natural surrounds, even a moth visitor! Most guests collaborated within their groups, using the tools and materials to create an artwork all together with a frame and picture. Some communicated while they worked, while others made their contributions to the artwork a surprise. For additional inspiration, we had displayed on the tables a variety of collage books where artists used the technique of collage to illustrate the book. If you are looking for more inspirational resources around collage, we’re happy to share that the Art Studio has collaborated with Shannon Merenstein, owner, creative director, and lead educator at Hatch Art Studio, to create a book called Collage Workshop for Kids, published by The Quarto Group! We contributed studio project reflections and images inspired by Shannon’s rich collage explorations found within each chapter. The book is available through our Shop, and Shannon will be facilitating a workshop this fall on joyful and imaginative art-making. We hope you enjoy the book, participate in the workshop, and/or enjoy making your own collages! This entry was posted on Wednesday, October 10th, 2018 at 9:20 am and is filed under By Sara Ottomano, Collage, Every Day Art Program, Paper, Resources. You can follow any responses to this entry through the RSS 2.0 feed. You can leave a response, or trackback from your own site.